NEXT ARTICLEHoly Moly! 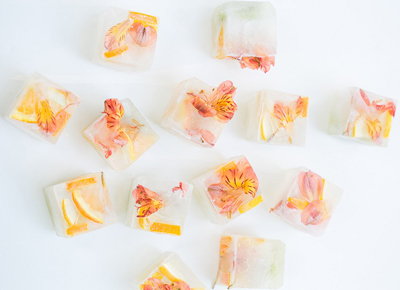 Sweet Floral Ice Cubes! Seriously. Guys. This is what we’re talking about: marbled agate-like swirls bursting from the middle of the cake (and matching complimentary rock-candy stirrers). The color is everything. You can also go cooler with silver accents and gradients of deep-blue candy crystals to give the appearance of really gazing into cracked rock. Lighter colors work well, too. Peach and pink swirls wrap this rose-quartz-colored geode cake, giving it movement. A rich, royal purple (or deep navy) plus the shine of gold leaf makes this option a bit more formal. Go this route if you want just a few artful touches of the design but not a full rock formation. How can you not love the modern coolness of this Wizard of Oz-esque creation? Heads up: You don’t have to go full-on geode to nod to the trend. Another option would be to stud the cake with smaller sugar rocks on an ultra-smooth buttercream. Super elegant without being over the top, this cake has height, sparkle and dimension. The best part? The sliced agate on top is still made of candy. Not quite ready to dive headlong into the trend? Go reserved with a neutral- or deep-toned cake. Then simply top it with real decorative geodes. Another for the faint of heart. You can literally top any cake with any geode. You’d never know this sleek metal-like cake was filled with violet and vanilla bean. But just wait till the guests dig in.